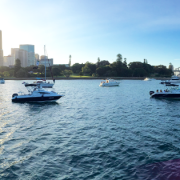 You are here: Home / Read Our Blog / Sydney Harbour / Cool facts about Sydney’s New Year’s Eve fireworks! Cool facts about Sydney’s New Year’s Eve fireworks! – Over 1 billion people will watch the Sydney fireworks on TV across the globe! Rockfish is available for charter for next New Year’s Eve, 31 December 2014. For enquiries contact us! https://www.rockfish.com.au/wp-content/uploads/2013/12/NYE-fireworks.png 315 851 Dirk Radke https://www.rockfish.com.au/wp-content/uploads/2017/02/logo-compressed.png Dirk Radke2013-12-16 05:16:212017-11-01 14:57:12Cool facts about Sydney's New Year's Eve fireworks! Is the catamaran still available for New Year’s Eve ? Hi Vincent, unfortunately, we’re all booked up for New Year’s Eve but if you had an alternative date in mind, let us know and we’ll check availability for you!